Yeah for rain days! It’s raining today, perfect timing. After a long winter and a hurried spring, it’s nice to have a day indoors. I’m making Chicken Marsala for supper. It’s been a week of simple meals and I’m really looking forward to sitting down with the chicken, fresh asparagus and brown rice. 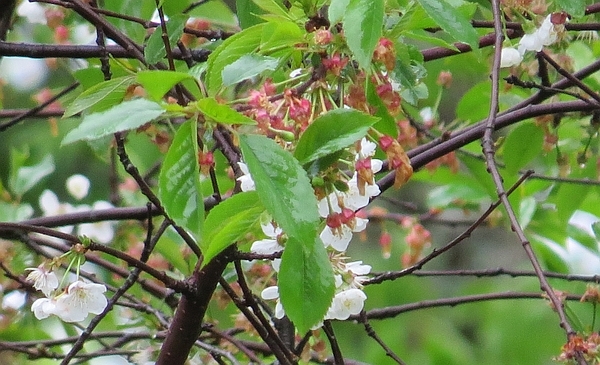 A few late blooming tart cherry blossoms. The washing machine is getting a workout today. It’s not the best timing but oh when you are a homesteader things sometimes get done when they get done. As much as I love to hang clothes on the line to dry, it’s not happening on this rainy day. I’ll miss sleeping on sheets that were dried in the sun and fresh air and scented by cherry and lilac blossoms, but I’ll fall asleep so fast tonight I won’t miss them for long. Today the dryer is running. Sometimes we compromise in order to get things done and that’s okay. Also earning its keep today – the dishwasher. I sometimes like to hand wash dishes but this isn’t one of those times. I’ve cleaned out the refrigerator (bonus points for getting this done before science projects sprouted in the back corners), made the chickens happy with their windfall of leftovers, and filled the dish washer. Twice. I love being able to open the door and see what’s in there without squinting or worrying something will fall out and crush my toes. Clutter gets on my nerves so on this peaceful rainy day, I’m de-cluttering. I am reasonably sure two people do not need eight sandwich containers (we seldom eat sandwiches to begin with). I’ve accumulated a half dozen candles that have only an hour or two worth of wax and wick left so one at a time, I’m burning them. Pine & Balsam in the living room, then Woodland Forest in the kitchen at the other end of the house, and when that was gone I’ll choose another scent. The candle jars will be passed on to a friend who’ll use them to plant succulents. Waste not, want not, yes? I’m happy to see the rain for the sake of the strawberries. I’m growing Sparkle, a variety with a lot of runners. Some of the parent plants from last year have four or five babies. I’ve dug them up, transplanted them to a new strawberry patch, and have watered them daily. Today’s rain gives me a break from watering and gives the plants a break from the bright sun. They looked terrible yesterday but better today. The apple, pear and cherry blossoms are almost gone. The bees had a nice long spell of good weather and got their job of pollinating done before the rain came. I sit here by the window, looking out at a young apple tree with a few straggling blossoms left, and think ahead to the apples I’ll be using for sauce and pies, leaving some behind for the white-tail deer. I’ll make cherry jelly with the tart cherries if I can pick them before the robins and blue jays discover them. 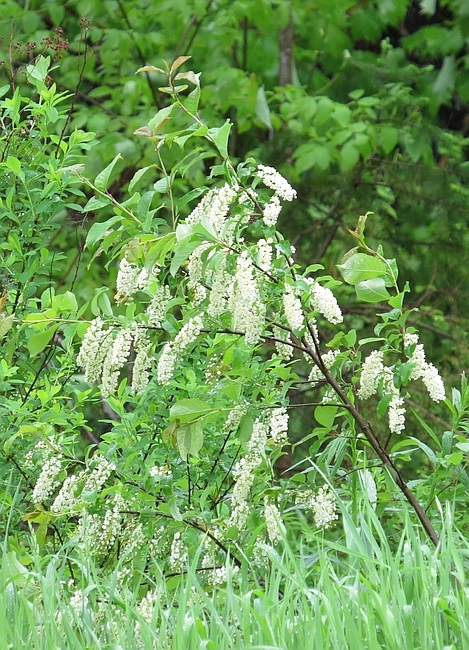 The choke cherries are left for the birds, and sometimes the bears, a bit more tart than we like. Peaceful, lazy rainy days sure are busy. They’re a welcome change of pace at the end of a busy week and before the start of a sunny, hot weekend. 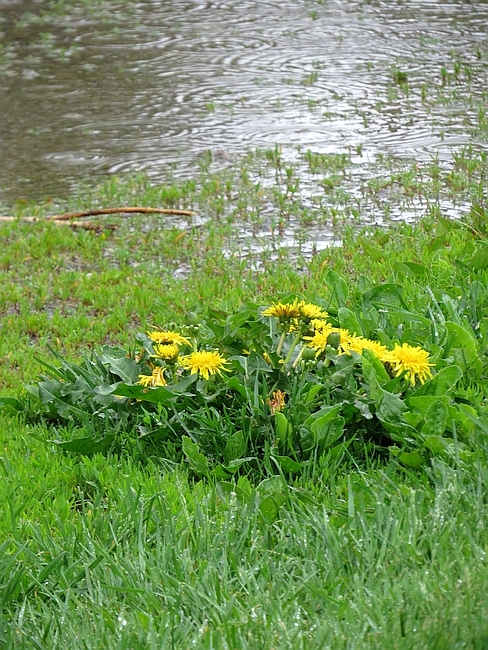 This entry was posted in Homesteading and tagged rain day on June 6, 2014 by Homesteader's Supply.